Ten years ago a tiny skeleton unlike anything that had been seen before was found in the Atacama Desert. It’s only six inches long, with a very elongated, alien-looking skull – shades of Indiana Jones and the Crystal Skulls! Recent DNA testing has indicated that it’s a human skeleton, but there are many issues: the skeleton appears to be of someone who was roughly 6-8 years old, and it has fewer ribs than would be normal in a human. The cone-shaped skull could have been the result of a birth defect, but not all the genes matched those found in humans. There are theories that it was a primate, or a human with a number of birth defects, although in modern history there’s never been a medium-aged child that tiny. Unsurprisingly, there’s also been speculation that it could be an alien from another planet – if you look at the photo in the original article in the Live Science website, you’ll see why people might think that. I was in Peru and Bolivia last fall, and the landscape in southern Peru, which is sometimes classed as part of the Atacama Desert, is very alien – it would make a great setting for a sci-fi movie! The Nazca Plateau in particular is a fantastic sight, layers of multi-coloured earth covered in the hundreds of strange shapes, both animalistic and geometric, sculpted by the Nazca peoples many hundreds of years ago. Seeing the shapes from the air is an amazing experience – you can see why the gigantic animal shapes might be used for ritual purposes, but there are also straight lines running in a variety of directions for miles and miles, and huge trapezoids running across the plateau and into the mountains, that don’t seem to make any sense at all. On the ground, we walked the burning sands around Chauchilla Cemetery, strewn with the house-like tombs of the Nazca dead, and churned by numerous towering dust devils. I’d never seen one in real life before, and they are eerie. In the photo above you can see three at the same time silently whirling around in the distance: one on the left, another in the centre and a fainter third on the right to the right side of the road. 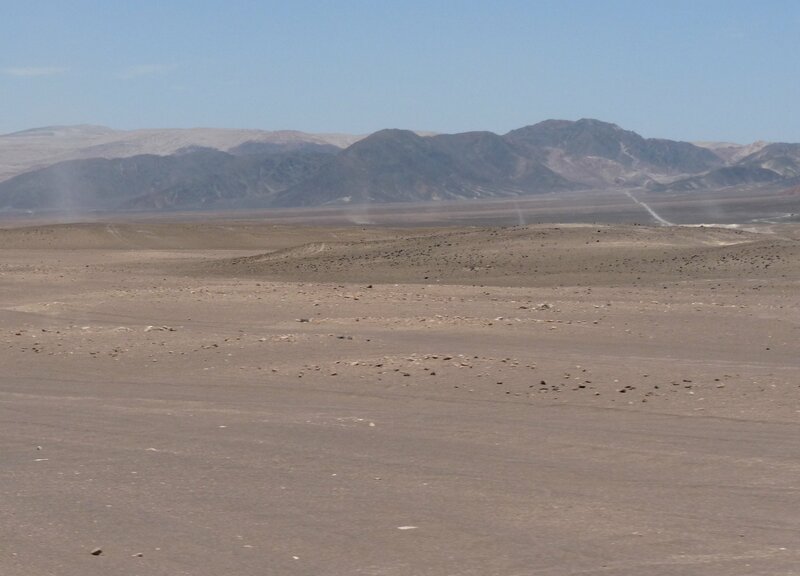 The Atacama Desert is the driest place on our planet and has been compared to the planet Mars. The heat and aridity are forbidding; it’s hard to imagine anyone wanting to live there. If you want to experience a truly other-worldly landscape, you don’t need to go into space — just head to the west coast of South America!